For over 85 years, Oakley Steel has maintained a reputation for excellence in custom steel fabrication, specializing in short lead times. We were commissioned to supply the steel components for the landfill compactor featured here, including the plow plate, cylinder, and cone. Our facility is equipped with large scale metal forming equipment that can provide heavy carbon steel machinery components, such as the parts shown here. Our Rollform section bender was employed to perform heavy plate bending and forming processes to reach the required dimensions. 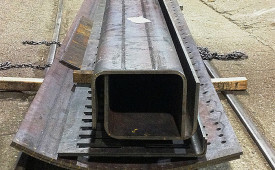 Finished dimensions of the cylinder was 2″ thick x 48″ OD x 6′ long. The cone was 10″ high, 1/2″ thick x 44″ max OD x 36″ minor OD. 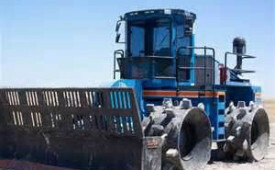 The plow plate was made up of a 3/4″ thick x 20′ long channel, and two formed plates with dimensions of 1/2″ thick x 20′ long, and 3/4″ thick x 20′ long. Tight tolerances were held throughout production, ± 1/16″ for the plate and ± 1/8″ for the cylinder and cone. This project was completed in only 1 week, delivered to the customer in the Midwest. We maintain a yearly production schedule of 30 plates and 120 cones and cylinders for this client. Oakley Steel is dedicated to providing superior products for a variety of industries and applications, meeting virtually any steel forming requirements. For more information about this landfill compactor project, or any of our other high quality custom steel fabrication capabilities, please see the table below or contact us directly. 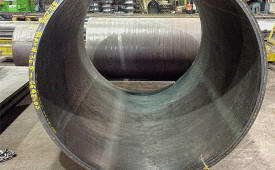 Tolerances 120 ft. radius 3/16"